Temperature : Max. 41°C and Min. 25°C in Summer.Max. 23°C and Min. 7°C in Winter. Clothing : Light Tropical in Summer.Heavy Woollen in Winter. 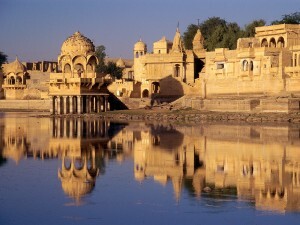 Rising from the heart of the Thar Desert like a golden mirage is the city of Jaisalmer. It was built in 1156 A.D. by Rawal Jaisal, perched on the Trikuta hill. 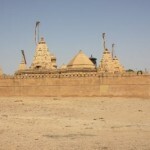 For years Jaisalmer remained untouched by the outside influences. The rise of shipping trade and the port of Mumbai saw the decline of Jaisalmer. But the desert fortress that seems to be straight out of the ‘Tales of the Arabian Nights’ still enchants. The life within the citadel conjures up images of medieval majesty visible in its narrow lanes strewn with magnificent palaces, havelis, temples and of course skilled artisans and ubiquitous camels. The setting sun turning Jaisalmer into beautiful golden brown is a spectacular sight. The perfect time to visit the golden city is during the desert festival, held in January to February every year. Air: Flight services are available from major cities of India. Nearest airport is Jodhpur(285 km). Rail: Rail connection with major cities of the country through Jodhpur. Nearest railhead is Jodhpur. Road: A good network of roads joins Jaisalmer with many destinations in and around Rajasthan. Local Transport: Unmetered taxis, auto-rickshaws and jeeps. 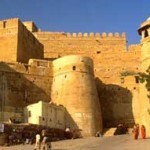 Jaisalmer Fort: The golden hued fort is a great interest of Rajasthan. Some ancient temples are also located here. Manak Chowk and Havelis: This is a main market place outside the fort leads to the narrow lanes dotted with famous havelis. Nathmalji-Ki-Haveli: The late 19th century haveli with intricate architecture a display of sheer craftsmanship. The left and right wings of the mansion, which were carved by two brothers are not identical but very similar and balanced in design. The interior walls are ornate with splendid miniature paintings. 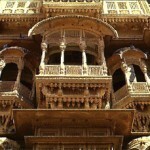 Patwon-Ki-Haveli: The most elaborate and magnificent of all the jaisalmer havelis. 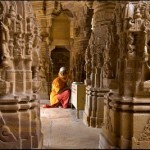 It has exquisitely carved pillars and extensive corridors and chambers. One of the apartments of this five storey high haveli is painted with beautiful murals. 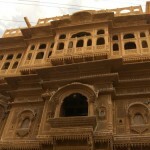 Salim Singh-Ki-Haveli: This 300 years old haveli of Jaisalmer’s prime Minister to Maharaja Rawal Gaj Singh-Salim singh, has a beautiful blue cupola roof with superbly carved brackets in the form of peacocks. This extraordinary mansion in yellow stone is covered with intricate carvings and has an elaborate projecting balcony on the top storey. The mansion is one of the most notable of the array of havelis. Jain Temple: The fort has three exquisitely carved Jain Temples dedicated to the Jain Tirthankaras, Rishadev, Sambhavnath and Parswanath. Tazia Tower: A pagoda like structure looming up from the ‘Badal Mahal’ with beautiful ‘Tazias’, ornately decorated bamboo, paper and tinsel replicas of a bier, carried out in procession during Moharram by the Muslims. Gadsisar Lake: This is an oasis in the desert. A scenic rain water lake with numerous beautiful shrines around and a spectacular avian variety. The lake is an idyllic spot for outings. 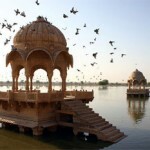 Amar Sagar: Amar Sagar is situated 5 km from Jaisalmer. A pleasant garden beside a lake with mango and other fruit trees. Beautifully carved Jain temples add to its splendour. 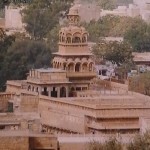 Bada Bagh: Bada Bagh is situated 6 km from Jaisalmer. This is an oasis on the bank of an artificial lake. It is surrounded by dense trees are the royal cenotaphs with beautifully carved ceilings and equestrian statues of the former rulers. Much of the city’s fruits and vegetables are grown here. 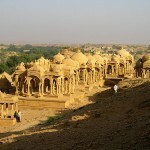 Lodurva: Lodurva is situated 16 km of Jaisalmer. It is a town of great antiquity. Lodurva was the capital of Bhati Rajputs before Rawal Jaisal founded Jaisalmer in 1155 A.D. Lodurva was a flourishing town in 10th and 11th century A.D. It was a centre of art and architecture. The exquisite carvings and other remains of ancient monuments provide a glimpse of Lodurva’s glorious past. Wood Fossil Park: Wood fossil park is situated 17 km of Jaisalmer on the Barmer Road, this park takes you back to the Jurassic period, when the whole Thar region lay under the sea, with 180 million years old fossils. The place is the geological landmarks for the study of the Thar Desert. The park is open everyday from 8 a.m. to 6 p.m.
Mool Sagar: Mool Sagar is situated 18 km from Jaisalmer. The pleasant shady grove is a perfect picnic spot during summers. 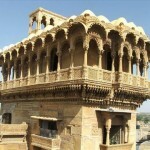 This entry was posted in Jaisalmer, Rajasthan and tagged about jaisalmer, Amar Sagar, Bada Bagh, bikaner jaisalmer, Gadsisar Lake, Gyan Bhandar, haveli jaisalmer, Havelis, Jain Temple, jaipur jaisalmer, jaipur to jaisalmer, Jaisalmer Fort, jaisalmer forts, jaisalmer sightseeing, jaisalmer tour, jaisalmer tours, Library, Lodurva, Manak Chowk, Mool Sagar, Nathmalji-Ki-Haveli, patwon ki haveli jaisalmer, Patwon-Ki-Haveli, Salim Singh-Ki-Haveli, Tazia Tower, udaipur to jaisalmer, ur jaisalmer, Wood Fossil Park. Bookmark the permalink.